When you have a serious allergy, sussing out what foods are safe and what foods aren’t is harder than you might think. For people allergic to peanuts, the consequences of taking a chance on a particular food can be dire. Some people experience anaphylaxis within seconds of eating peanuts, even if it’s just trace amounts. But trying to eat exclusively certified allergen-free foods can be next to impossible, unless you plan on carrying a full supply of snacks everywhere you go. Nima, a portable sensor for allergens, can help. Nima is designed to be used at the dinner table, so that you can test the food you’re about to eat. The company debuted the sensor as a solution for people with gluten allergies in 2017, but now, it’s expanding its offerings: There’s a Nima for peanut allergies, too. The device works like this: You take a small, pea-sized sample of whatever food you’re hoping to eat, and shove it into one of Nima’s one-time-use capsules, which look sort of like a slim canister for a roll of film. Tighten the lid, stick the capsule inside the device, and turn it on. The device will whirl and click for a few minutes, then a symbol will appear on the thin LED screen on the side. It will show either a happy face (no allergens!) or, in the case of peanut allergens, a little drawing of a peanut with the words “Peanut Found.” You can then go into the associated app and log what you tested and the results, so that people around you can also see that, for instance, the muffins at that particular cafe are contaminated with peanuts. 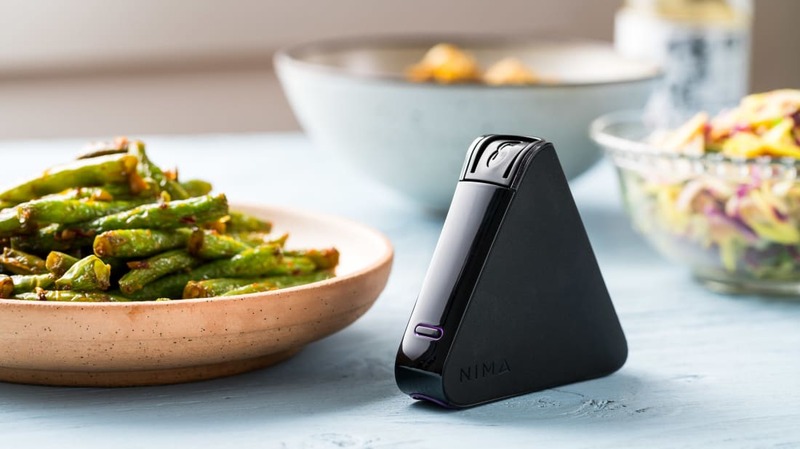 The Nima peanut sensor can detect 10 parts per million of peanut protein (the lowest effect level observed in clinical studies), while the gluten sensor can detect gluten levels of 20 parts per million or more (the cutoff the FDA uses to decide what foods can be labeled “gluten free”). Unfortunately for those who are both gluten- and peanut-free, you can’t use one sensor to test for both types of allergens. As a prevention method, Nima isn’t perfect. In certain cases, like if the food is sitting in a display case with other foods, it’s possible that the piece of the food you’re testing doesn’t contain any allergens, but another part of it has been contaminated. The company recommends that you still carry an EpiPen for emergencies, and do your due diligence before eating. But it can provide a little extra peace of mind for people with strict dietary restrictions—or at least a good warning signal. The device is small enough to carry around in a purse or a jacket pocket, and can rest in the palm of your hand. It's easy enough for a kid to use, and sleek enough to not call too much attention to itself if you’re testing out your dish in front of an entire restaurant. And it's convenient enough that you’ll actually go ahead and do that. The Nima peanut sensor is $229.99 on its own, or you can buy a starter pack for $289.99, which comes with the sensor and 12 testing capsules.